Among many other things, the Lord’s Prayer gives us clear reasons for Jesus’ birth. Consider each line of this prayer. So, as we celebrate the incarnation, let’s not forget Jesus’ clear instructions in prayer. Of course, you can find out much more about how to use the Lord’s Prayer as a pattern for your own personal prayer by seeing Living Prayer: the Lord’s Prayer Alive in You. You probably know that the Lord’s Prayer has been a foundation for my life for many years. It has shaped not only my prayer life and my spiritual life, but all the other area of my life as well. I don’t pray it in some kind of mechanistic, rote manner. But I do let the pattern of the Lord’s Prayer shape my regular times of prayer. And it doesn’t get old! I want to share with you some fresh words I have added as I pray from this prayer. But first a little overview. The first three requests of this prayer focus on God and His big desires. These themes are not only presented in this prayer, they can be seen throughout the entire Bible. That His name be holy on earth as it is in Heaven. That His kingdom would come on earth as it is in Heaven. That His will would be done on earth as it is in Heaven. That His name would be revealed and revered. That His kingdom would be established and expanded. That His will would be understood and accomplished. Most recently, as I have prayed, I have added a one more word to each these lines. That His name would be revealed, revered, and received. That His kingdom would be established, expanded, and embraced. That His will would be understood, accomplished, and accepted. These three fresh words add a more personal dimension to the lines. Yes, I want Him to reveal His name (i.e. His nature, His character, His reputation, etc.) to me. And I want to revere His name more and more. And I also want to receive Him for all that He is. John 1:12 (Yet to all who did receive him, to those who believed in his name, he gave the right to become children of God.) is not only for those who don’t know Jesus. Every time we receive Him for who He really is, we receive more of the life that is in Him. And I want His kingdom (His rule, His governance, His way of life) to be established and expanded. But I also what it to be embraced. I want to embrace it and I want others to embrace it as well. I don’t want His kingdom simply imposed upon me and others as though it was not the best possible way of living. I want to embrace both the kingdom and the KIng because it is a great gift to be part of His kingdom and in relationship with the King! Finally, I want not only to understand and accomplish His will (His desires, His purposes, His plans) I also want to accept it. His will really is better than my will. Romans 12:2 says that when we are not conformed to this world, we get to demonstrate and accept His good and perfect will for us. I want to accept His will without Him needing to convince me that it is best. I want to accept it the first time I hear it. I want to accept it without trying to convince Him that perhaps He should consider my will as well. Much more could be said about these lines and these words. But I encourage you to talk to the Lord in prayer about them and listen to what He may want to tell you about them. This week has been especially encouraging for this teacher. I have many different responsibilities I fulfill, but none more fulfilling then sharing with others some things that matter to me. Two different women’s Bible Studies in Clark Couty are using Living Prayer as their fall Bilie study. The studies will last 10-11 weeks. They both asked if I could help them get it started off right. 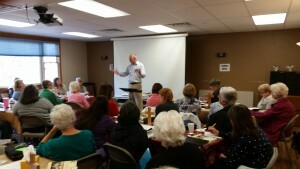 So, on Wednesday morning I shared with a small group of women in Ridgefiled, WA. Then on Thursday morning I did a similar thing with a larger group for a church in Vancouver. I was delighted to be with each group. They were hungry for a deeper relationshi p with Jesus, and really prepped to pursue His clear instrucitons on prayer. They asked some great questions. I am confident that Jesus will have better prayer-disiples as these weeks pass. Then, this weekend, I get to return to Everett, WA. and share with the saints at Bethel Baptist again. Then, Sunday night and Monday night, I get to present the “Written on Our Hearts” seminar based upon Experiencing Life and Power through Biblical Mediation. 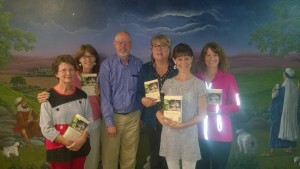 for their congregation and others who join us through the Awakenings Prayer Institute. In addition to these times, several people have initiated a conversation with me and told me (rather enthusiastically) how one of my books has impacted their lives. I mention these things so you can “rejoice with those who rejoice,” but also so you can pray for the ongoing impact of these events and comments. I love the fact that Jesus tells us how to pray and He tells us how not to pray. He knows more about prayer than we do and we are wise to listen to His specific instructions and follow them. Before Jesus tells us how to pray in Matthew 6 He first tells us two ways He does not want us to pray. Jesus does not want us to pray like hypocrites (Matt 6:5) and He doesn’t want us to pray like pagans (Matt 6:7). You probably know that the word “hypocrite” is normally seen as a derogatory word. But it simply means “actor.” Actors aren’t bad in and of themselves. There is a place for acting. But that place is not when we are praying. The word translated “pagan” or “heathen” or “Gentile” basically means one who is “not from these parts.” That is they don’t know what we know. And specifically they don’t know the one true God. The first warning has to do with how we see ourselves – that we think we are more important than we actually are. The second has to do with how we see God – that we think He is less important than He actually is. Likewise, when we pray, we should not see God as being less than He actually is! We should not think we are praying to an inadequate God! We shouldn’t pray as if God requires a certain formula, needs our help to know what He should do, or needs us to convince Him that our ideas really are the best ideas. This is how those who do not know God pray. Those who know the One, True, God get to pray differently. We get to pray, not to an audience, but to our Father! We don’t have to pray for the ears and approval of others. We get to pray for the approval of the One whose approval really matters! So, when we pray, if we shouldn’t try to impress other people, are not trying to inform God or convince God, then what’s left? Why should we pray? Very simply, to align ourselves with God’s good purposes. To line up our heart, our spirit, our thinking, our desires, our words, our motives, our attitudes, our actions – our everything (!) with what He wants to do in us and through us. I suggest, this is what the Scripture means when it calls us to pray according to God’s will. When we do this, there is no need to pray like the hypocrites or the pagans. One of my first significant discoveries about praying the Lord’s Prayer in a meaningful manner was when I saw the two clear halves of this prayer. The repeated pronouns tell us this. The first repeated pronoun is “Thy” or “Your.” These tell us that the first three requests are related to “Your name, Your kingdom, and Your will.” The second repeated pronoun is “us.” It is used four times in the second half of the prayer. The requests here are “Give us, forgive us, lead us and deliver us.” Praying around these pronouns has given me many hours of meaningful time in His presence. Just recently, after praying this prayer for over 30 years, I found myself praying the second half of this prayer in a way I had never prayed before. That’s one of the joys of this prayer… It is inexhaustible! A little more explanation is necessary. Just as the first three requests of this prayer point us to the three big desires of God’s heart, the four requests of the second half point to the four big needs of mankind: our need for His provision, His pardon, His direction, and His deliverance. As I have pondered these four areas of need, I know of no need I have that does not fall under one of them. So, recently I found myself praying that today I would clearly recognize my need for His provision. That I would not think I have everything I need, in and of myself. That I would be quick to turn to Him as my only true and sufficient Provider. Then I prayed that I would not only recognize my need, but that I would receive His provision. That I would not only see that He is my only true Provider, but that I would receive the provision He offers me today. Finally I prayed that as I received His provision, I would also be quick to share that provision with others. That I would be able to notice the needs of others like my Father notices my needs and that I would be as quick to help meet their needs as my Father is to meet my needs. This pattern (of recognizing, receiving and sharing) worked so well for the “Give us” request that I tried if for the “Forgive us” request. It worked even better! So, I went on to both the “Lead us and Deliver us” requests. This little pattern has given me more ways to glean good/God prayers from Jesus’ simple, yet profound instruction. In fact, I could say, it is another way in which this prayer has become a Living Prayer. To help summarize this process, here is a PDF file of what I call Praying The Second Half. Please remember that this chart is much more rigid and sterile than the prayers that preceded it. And it is much more abbreviated too. In fact, we could say that this chart is only a “dehydrated” version of my prayers. So, my encouragement is to let the Water of Life be added to this process and see how the Lord leads you in times of meaningful, fresh prayer. Take some time with it, listen for and to His Spirit and see how He teaches you to pray. The third factor in why I take the Lord’s Prayer seriously is the Relational Factor. I encourage you to read what I have written about the first two factors (the Obedience Factor and the Practical Factor.) But, my bias is that the Relational Factor is the best reason to use this clear teaching of Jesus as a pattern for my own personal times of prayer. Let me share something that may seem like heresy. Jesus did not leave heaven, come to earth, live a perfect life, die a cruel death, and be raised back to life again simply so you and I could have our sins forgiven. Nor did He do all of that in order to make sure we could get to heaven. There was and is a much more significant reason Jesus did these things. That is, so that the God of the Universe could again have a relationship with us who embraced sin instead of Him! Now, in order for us to have a relationship with Him He needed to deal with this issue of our sin. And because our sin-debt is taken care of, we have the privilege of living with Him in heaven. But the motivating factor has always been to reestablish the relationship with us He was dreaming about when He created Adam and Eve. Heresy? No, not really. And, what develops relationship? Every relationship we have is defined and determined by the level of communication in that relationship. No communication = no relationship. Sloppy communication = sloppy relationship. Bad communication = bad relationship. Good communication = good relationship. This is true for human relationships and it is true for our relationship with God. The level of our communication with God defines and determines that relationship. Since prayer – listening and speaking – is the essence of our communication with God, if you show me your prayer life, I will show you your relationship with God. So, when Jesus Himself – “Second Person of the Trinity” – tells us how to communicate with Him, we can anticipate it will help our relationship with Him when we follow His pattern. As we pray this pattern, we see the Father’s priorities, we see His nature, we see His desires, we see His willingness to engage with us. We understand His character, His purposes, His heart, and His call to us. He is calling us to embrace His wisdom, His ways, His decisions, His provision, His pardon, His direction, and His protection. These lines teach us about who God is and who we are. What He wants, what we need, ad what He is willing to give us. We can see His past, His present, and His future. I take these instructions seriously because the One who gave them to me has is smarter than me and has authority over me (the Obedience Factor). I pray this way because this is the best pattern I know of (the Practical Factor). And I pray this way because as I have, it has deepened my relationship with my Best Friend. Again, I invite you to join me. As part of the Living Prayer Seminar, I share three key reasons why I take the Lord’s Prayer seriously. I do this because the main point of the Seminar is to encourage people not to know more about this prayer, but to actually use it as a regular pattern for their own times of prayer. Here is a summary of the Obedience Factor. First, consider that this is God-in-human-flesh giving this instruction. There is no one more qualified than Jesus to teach us on this topic. He is worthy to be obeyed. •	John 13:17 – “The blessing” does not come with the knowing, but with the doing. •	James 1:22 – On the other hand, not doing can lead us to deception. •	Matthew 7:24-27 – The foolish man is not the man who does not hear Jesus. It is the one who hears Jesus and does not obey him. And the wise man is not the one who simply hears Jesus. It is the one who hears and obeys. Also note that Matthew 7 comes right after Matthew 6! Why is that significant? Because at least some of the “words” Jesus had in mind in this story are the exact words of the Lord’s Prayer. •	Luke 8:21 – When someone told Jesus that His family was close by, He said those who hear and do His word are His real family. •	Luke 11:28 – In response to a women who called out that Jesus’ mother must be a blessed women, He corrected her saying the real blessing comes from hearing and obeying God’s word. If this represents what might happen in our future, I want you to be able to give a good solid answer to that question. So, here is what I hope you don’t say. And the list could go on… But let’s eliminate all of the reasons why we are not taking His clear instructions seriously and ask Him regularly “Lord, teach us to pray.” Then, let’s not listen for a new answer. Let’s listen to the old answer. Ephesians 5:8 For you were once darkness, but now you are light in the Lord. Live as children of light 9 (for the fruit of the light consists in all goodness, righteousness and truth) 10 and find out what pleases the Lord. A key difference between living as we used to live (in darkness) and the way He has called us to live (in the light) is that we are on a quest to find out what pleases the Lord. His invitation to us is that if it does not please the Lord, let’s stay away; trouble ahead. If it pleases the Lord, come on; let’s go! So, what pleases God? In my quest, I have found this out. Prayer pleases Him. Take a look at Proverbs 15:8 – The Lord detests the sacrifice of the wicked, but the prayer of the upright pleases him. Prayer is both good and it pleases God. This is no surprise to us, but why do you suppose it pleases Him? I can think of several reasons. I will mention two here. 1) Prayer pleases God because God loves it when we show our dependence on Him. We are dependent all the time. Sometimes we know it and sometimes we don’t. But it is always beneficial to know that it is His air we breathe, His water we drink, His sun which warms us, and His Son who saves us. What pleases Him is when we act like we are dependent upon Him. Prayer – about the basic and the big things – is one key way we can demonstrate our dependence on Him. As we pray, we are intentionally recognizing that we can’t, but He can; that we don’t know what is best, but He does; that we are not in control, but He is. 2) Prayer pleases God because God loves it when we team with Him to see His will accomplished here on earth. Prayer is not primarily informing an ignorant God about what needs to be done. Nor is it about convincing and unwilling God to do what we think He should do. Prayer, at its core, is aligning all that I am – my words, motives, words, everything! – with His good and perfect will. There is so much in this world that does not reflect God’s will. He loves it when we who call Him “Father” cooperate with Him to see His will accomplished.